Side view of an GP 50 (50 kg) bomb. The GP 50 (50 kg) is an Italian general purpose high explosive (HE) bomb. Italian bombs are similar to Japanese bombs in regards to construction as multiple components either screwed, riveted or welded together as opposed to being one-piece construction. While Italian bombs typically are filled with cast TNT, a large number were manufactured with Amatol and TNT mixtures along with aluminium powder for an extra kick. 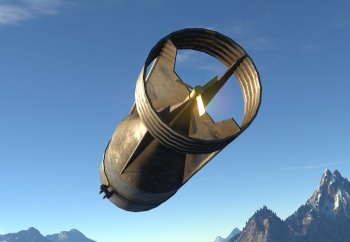 Smaller Italian bombs (100 kg and smaller) are typically only fuzed from the rear which is screwed into the base of the bomb and arm while free-falling as the arming vane begins to spin. A suspension lug is fitted to the nose of the bomb for vertical deployment like in the case of the Ba.65 (K.14) L or a suspension band with a lug fitted around the centre of gravity on the bomb for horizontal placement in bomb bays or external pylons such as on the Re.2000 G.A..
A top view of an GP 50 (50 kg) bomb with identification of parts. The GP 50 bomb body is typically filled through the base of the bomb, afterwards, a base plate is installed utilising screws or rivets. The tail section is next fitted over the base plate and is fixed in place either through using screws, rivets or welding. While tail units may vary in design, their diameter will not be larger than the diameter of the bomb body. The tail cone consists of four vanes, tail cone and a corrugated strengthening ring which are all manufactured from corrugated strengthening ring, all of which are manufactured from sheet metal. 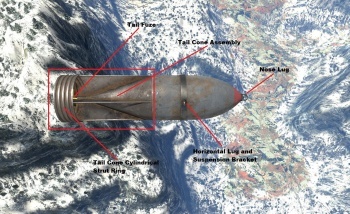 Amatol is the preferred explosive filler for the GP 50, a felt pad is installed in the nose of the bomb to break the shock of impact on the explosive filler leaving the booster and initiating charge of the fuze to start the explosion train resulting in the uniform detonation of the bomb. The fuze for the GP 50 attaches through the tail cone of the bomb. The fuze is screwed into the base of the bomb and typically has a long arming spindle which extends from the base through the tail cone. The end of the tail cone is configured to allow for the arming vane of the fuze to be protected (to prevent damage and bending of the arming vane), preventing damage which could render the bomb inactive and fail to arm when dropped. Italian bombs are typically painted or galvanized in an effort to prevent corrosion from deteriorating the bomb casing. As in the case of the GP 50, the body is painted a dull-blue with a red nose to distinguish it as a high-explosive bomb. A front view of an GP 50 (50 kg) bomb. Notice the nose lug utilised for vertical stowage in the bomb bay. The GP 50 utilised both TNT and Amatol as explosive fillers in its bombs, however Amatol quickly became the prefered filler as it also had aluminium powder added to the explosive compound which in of itself is a composition of TNT (Trinitrotoluene C7H5N3O6) and Ammonium Nitrate (N2H4O3). Amatol is a British name which comes from the words of the ingredients of this compound, Ammmonium and toluene. TNT in its pure form when detonated leaves a black smoke residue after it explodes due to the oxygen deficiency in TNT (does not fully explode/burn all components efficiently). To supplement TNT's need for oxygen, ammonium nitrate is added to the mixture which has an oxygen surplus and overall increases the energy release of a TNT explosion when mixed. On top of this with aluminium powder introduced to the mix, positive side effects include raising reaction temperature, enhancing the heat of the detonation, improve air blast and create an incendiary effect, literally getting more bang for the buck. When compared to each other, Amatol has a lower explosive velocity and brisance than pure TNT; however, due to Amatol creating a more efficient explosion plus the addition of the aluminium powder, it became the go-to explosive for Italian general purpose bombs. A rear view of an GP 50 (50 kg) bomb. Notice the tail fuze which arms the bomb after dropping from the aircraft. The GP 50 (50 kg) is a GP/HE bomb which was utilised by fighters, attackers and bombers. Due to its size, either one or two could be outfitted to a fighter or four to an attacker such as the Ba.65 (K.14) L allowing it to perform low-level precision bombing on AAA or light vehicles. 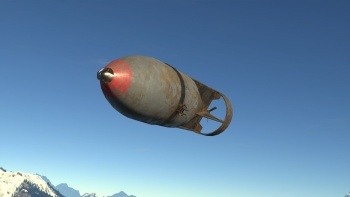 Bombers can carry between 12 to 28 of these bombs and could drop them all in one location bombing a base or could spread them out across the map depending on where the targets of opportunity are. Light armour vehicles and anti-aircraft guns are prime targets, however, these bombs don't have enough power to bust through hardened bunkers or tanks and with enough dropped can take out a base, but this will usually require several bombing runs with help from others to completely take out the base. GP 50 (50 kg) bombs mounted to an external pylon of a Re.2000 G.A. This page was last edited on 12 April 2019, at 01:46.